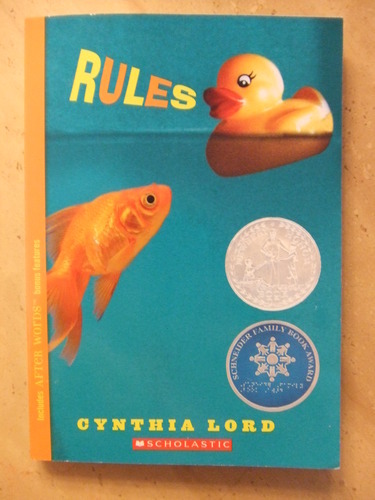 Several of my students recently finished reading Rules by Cynthia Lord, and each (not surprisingly) had a strikingly different response to the book, its characters, and their dramatic arc towards self-awareness. The book is a first-person account of a young girl’s experiences throughout one summer, where she and her family continue to struggle with her brother who has autism. Catherine has a love-hate relationship with David, and the many “rules” that her family creates in order to give David some structure and the ability to navigate social norms. During the summer, she and her mother take David to an occupational therapy clinic, where she meets Jason – a teenager who is confined to a wheelchair and cannot speak, but who uses a “communication book” to dialogue with others. 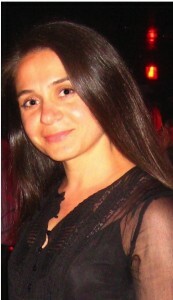 The central internal and external conflicts are her relationship with David and her family, and her burgeoning romantic feelings for Jason – each of which are neatly resolved at the end of the book. Unlike other books that elementary schools assign year after year, this book surprised me with its timely and personal message. As the caregiver of a disabled parent, I immediately gravitated to the core message of the book. I identified deeply with the emotional challenges Catherine faces as she tries to navigate the waters of adolescence while defining her identity as a sister, daughter and friend. I was yearning to see the same empathy and connection from my students – but I was met largely with radio silence. Sure, they understood the plot and could give me a biographical sketch of the characters. Yet, I found that they were not emotionally connecting with Catherine, and not empathizing with David or Jason. 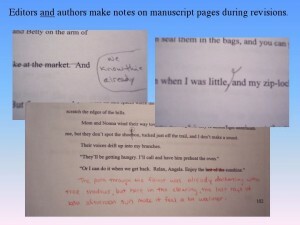 They were tasked with writing journal entries as they were reading, and a short book report in summation of the novel. One of the journal entries was to discuss a time when they met or had an encounter with a person who had a disability – and this is when I discovered that my initial inclination to think they’d just “get it” was somewhat misguided. They hadn’t lived or experienced enough to recognize these characters in their own life, and to apply the story they were reading to their own experiences. For a number of years now, I have been thinking about the significance of language and the words that give us the tools to describe objects, emotions, people, and places. As we read, experience and mature, our vocabulary and the breadth of our emotions expands. We learn the difference between incredible and delightful, between revulsion and loathing, between adore and admire. We hear the word “lease” and it immediately calls to mind a series of economical and social constructs. We say the word “home,” and there’s gravitas beyond the four walls around us and the roof over our heads. So, while Ramona Quimby may have been my childhood heroine, when I was actually the same age as the moppet, perhaps Rules resonated so much with me because of my decades’ worth of dealing with a Jason, and knowing many Davids. As profound and meaningful as the story was, with its youthful take on an issue facing many families and educators today, it didn’t seem to strike the same chord with these youngsters – and it took a lot of guided imagery and reflection to give them the emotional truth with which to write their journals and book reports. Simply for their youth and inexperience, these students weren’t able to immediately identify with the story. 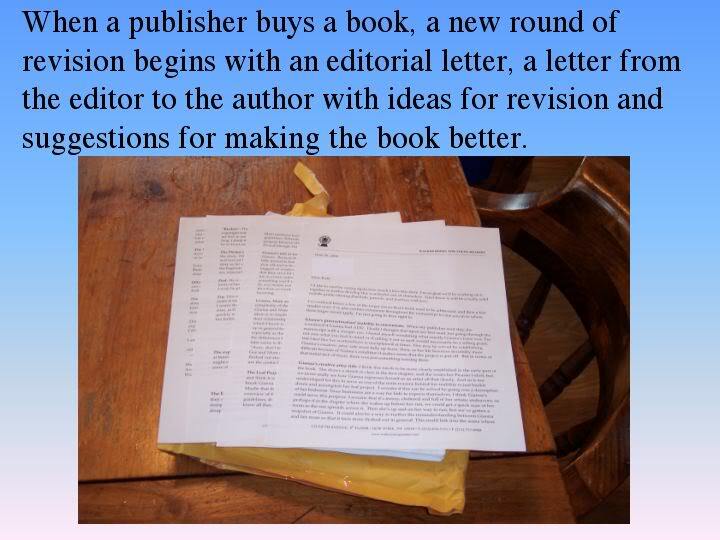 But, after considerable discussion and introspection, we were able to cull some poignant responses to their journal entries and craft thoughtful book reports. 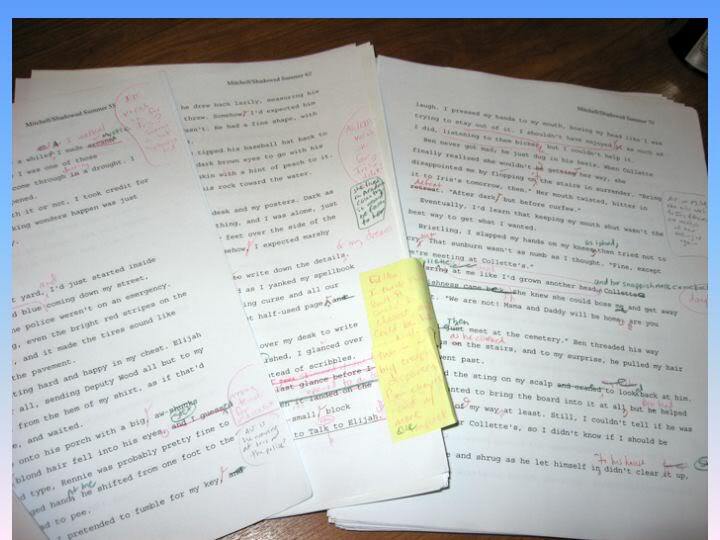 All told, it taught me the most significant rule of writing as it pertains to the words that we know: one may have a powerful vocabulary, but nothing can replace emotion and personal truth – what we know in the Traits as “the Idea” – as the foundation for a compelling essay. What does it mean to have a learning difference? There are as many answers to that question as there are people with learning differences. For some, numbers behave in a way that isn’t easily explained; for others, what they write on a page does not translate well from what they were thinking in their mind, or perhaps what they see in their writing, no one else can see. 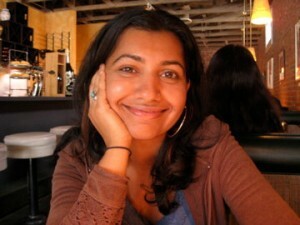 For those with learning differences, advocating for oneself is especially critical to personal and academic success. 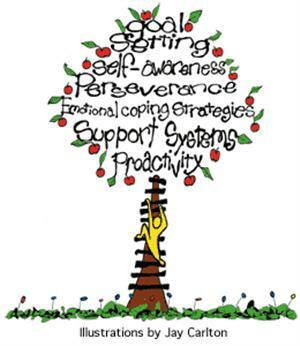 Self-advocacy for middle and high school students may mean taking an active role in one’s Individual Education Plan (IEP), since no one understands a student’s learning needs like the student him or herself. They should be participating in or, if possible, leading the way for, what is included in the IEP. One first step is compiling and writing out personal academic strengths and areas of need. The first time out, a student may need a teacher or other trusted supporter to guide them through the process, helping them consider what it’s like to complete class work, homework, or follow lessons in class. After an initial self-reflection, the student can actually write out his or her goals and levels of performance, although this step is often the root of the challenge for many students with learning differences. Then, students can rehearse these lines with their teacher or with someone they trust. And what about students who struggle to get even the most basic concepts on paper? Self-advocacy through writing an IEP may not be most beneficial for all students with special needs, but it’s a step in the right direction. 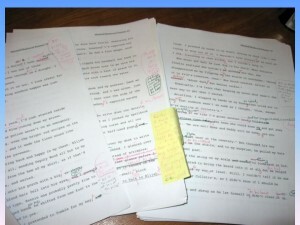 When students use writing to express their needs, great shifts occur in personal understanding. Likewise, students who express themselves with writing help others understand them better, which enables a child to receive more of the support they need. Understand your learning needs, discover who you are, and let people know! 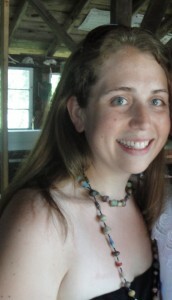 There are many websites that offer information about how students can increase self-advocacy skills. One good place to start is www.ldonline.com. 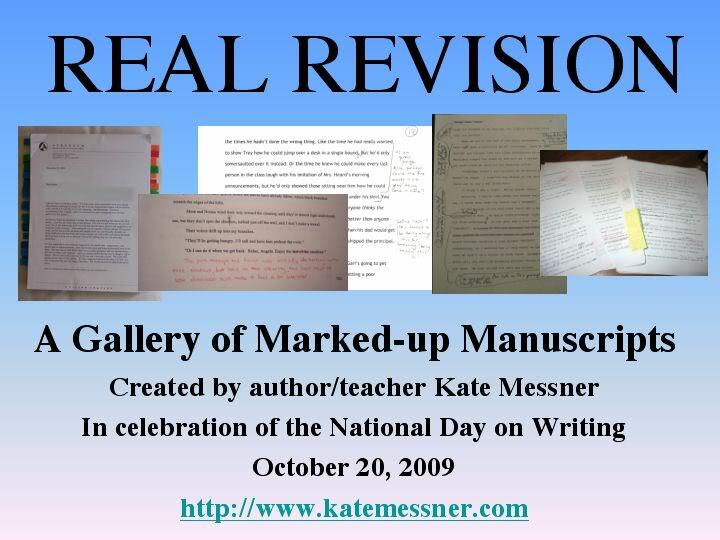 Your Published Author Revision Gallery — Happy Belated National Writing Day! We’re 10 days late on this news, but October 20th was National Writing Day. I happened across a 2009 blog post from prolific writer and teacher extraordinaire, Kate Messner, who put together a most fantastic revision resource for educators and students: a Slideshare, or Revision Gallery, with a collection of published authors’ revision notes from their editors, along with photos of their marked-up manuscripts.Real manuscripts from real authors! 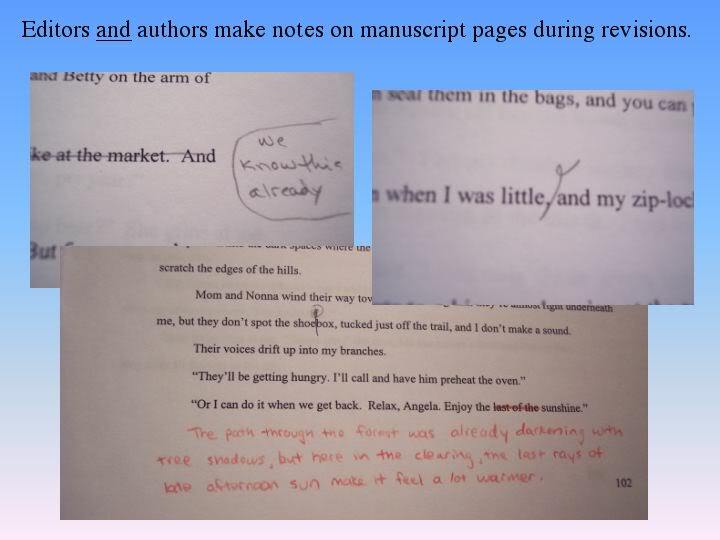 Nothing could provide for more authentic inspiration for understanding and appreciating the revision process for writers of all ages. Regardless of who wins the presidential election come November 6, in California, one thing’s for certain—the way we vote on propositions will have a massive impact on education. Two out of the eleven ballot initiatives this year specifically affect education policy: Proposition 30 and Proposition 38. Here’s a brief rundown of how each proposition will affect the lives of students, parents, and teachers. Backed by Governor Jerry Brown, the California Teachers Association, and a variety of unions, the goal of Prop 30 is to raise revenue for schools by temporarily increasing personal income tax rates on those who make over $250,000—as high as 3% if you’re in the highest income bracket. Everyone, regardless of income, will also have to pay an extra quarter-cent for every dollar in sales tax. Families making under $500,000 and individuals making less than $250,000 won’t see any difference in the amount of income tax they pay. Should Prop 30 pass, the revenue earned will be placed in a special Education Protection Account and 89% will go to schools and 11% to community colleges – that’s about $6.6 billion in increased education funding! Important: If Prop 30 is defeated not only will schools be denied much-needed funding, a series of reductions across a variety of programs, known as “trigger cuts” will immediately go into effect. Backed by civil rights attorney Molly Munger, Prop 38, like Prop 30, aims to increase revenue available for education spending, but in a different way. 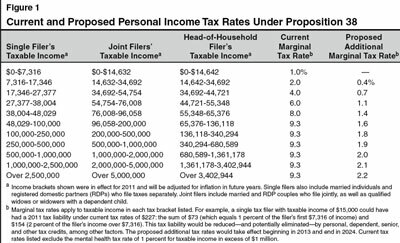 While the financial burden of Prop 30 would primarily fall on individuals making $250,000 a year or more, Prop 38 would increase the tax rate on all Californians except those in the lowest income bracket, and the rate increase would be dependent on an individual or family’s tax bracket. Furthermore, the legislation would be mandated for a twelve-year period, meaning that should there be any misappropriation of funds or should the proposition prove ineffective, the government would be powerless to do anything about the legislation until 2024. 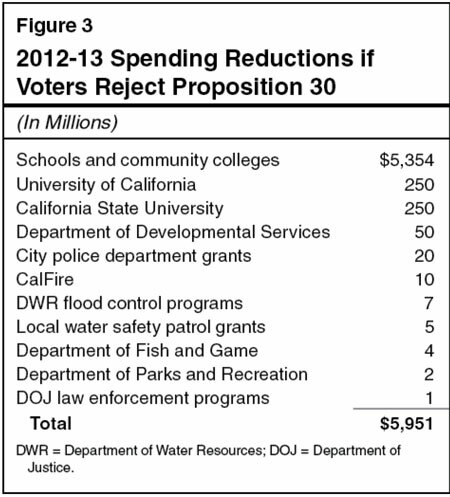 Unlike Prop 30, where all funds go entirely to schools, Prop 38 revenue will also go toward repaying the state’s debt. Should Prop 38 pass, 60% of funding will go directly to local schools on a per-student basis and out of the hands of Sacramento politicians, 10% to Early Childhood Education and Care, and 30% to paying state debts. 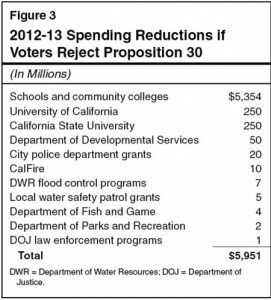 In short, both propositions are good for education, but only one has spending reductions (trigger cuts) associated with it should it not pass, and that’s Prop 30. Another important thing to note is that both propositions are considered conflicting, so only one can win. According to the state constitution, even if both props win, the one with more votes will actually win—meaning it could make sense to vote Yes on only the one you really believe in. For more (and impartial) information on both propositions, read the LAO’s breakdown of the propositions or the California voting guide. Support education and vote YES on Prop 30 or Prop 38!